Welcome to our gallery featuring a variety of fantastic pavilions! There are plenty of reasons to be outside, especially if you have a garden or yard to enjoy. But sometimes the weather does not always cooperate. Rain, snow, or even excessive heat can put a damper on your outside plans for the day. A pavilion is a possible solution to this issue. With its roof and open walls, a pavilion can provide protection from the rain and offer shade from the sun. You can extend your outside time even when the weather does not play along. However, a pavilion does take up a bit of space and requires a fair amount of yard. 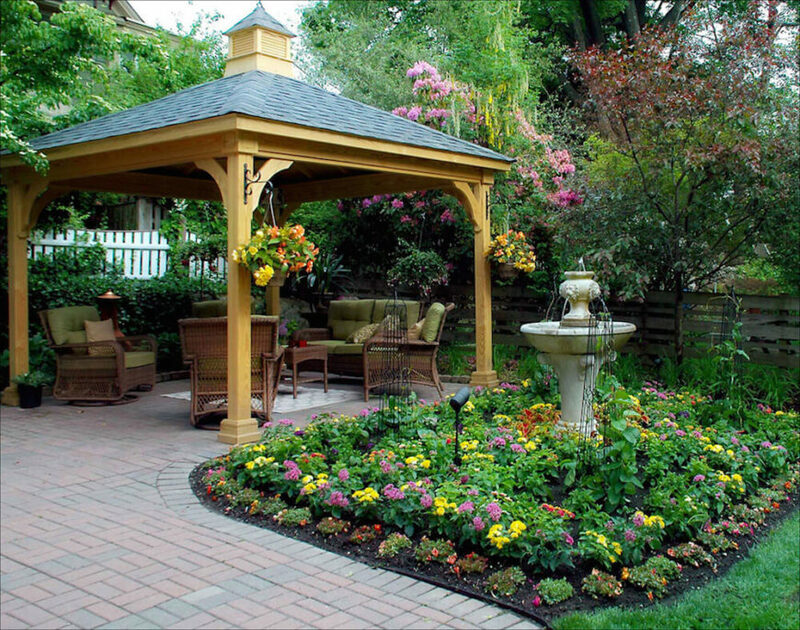 If you are limited on yard space it may be difficult for you to fit a pavilion in your yard. Pavilions can serve several purposes. 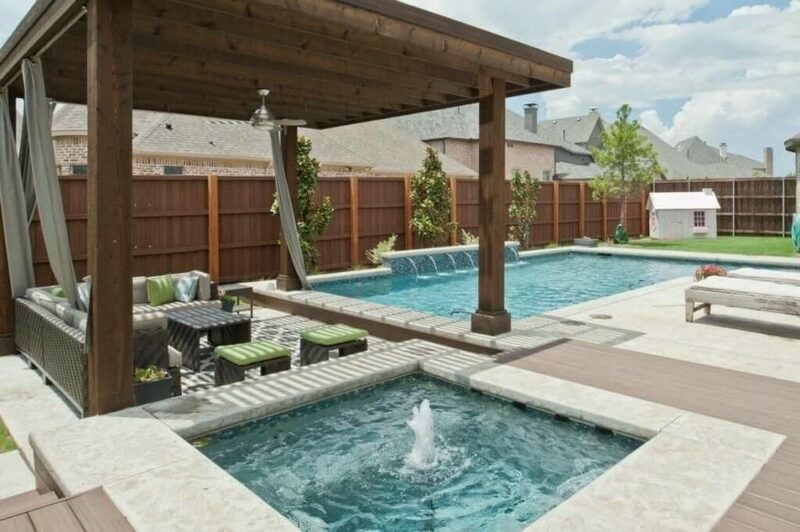 Some pavilions sit alongside pools, providing shade to pool goers when they are done swimming. Others sit above footpaths protecting walkers from the harsh sun as they enjoy the pathway. And then there are some that are used to cover eating areas for barbecues and parties. There are many places that pavilions work well in. But what are the pros and cons of building a pavilion? 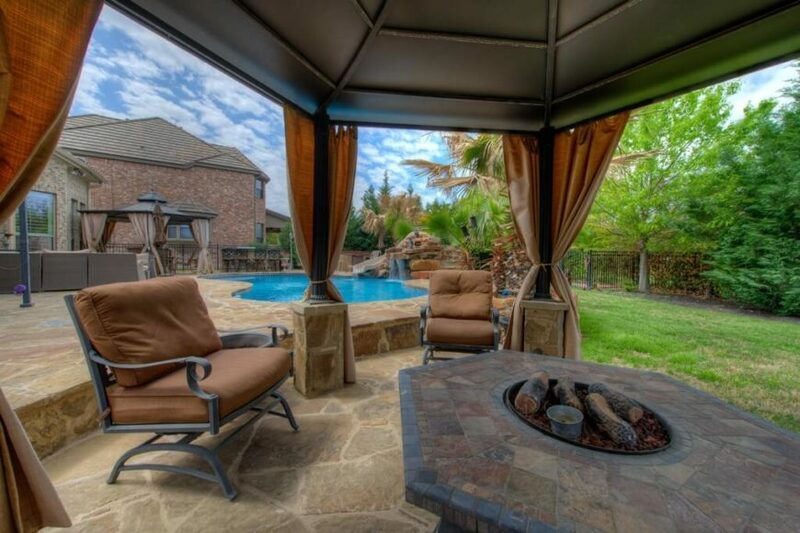 Shelter – If you need to keep the rain off of your barbecue or to have a retreat from the sun for your pool party, a pavilion will serve you well. Pavilions provide great coverage with minimal impact on space. Appeal – A well maintained pavilion looks great. It can spruce up your yard and create great visual appeal. 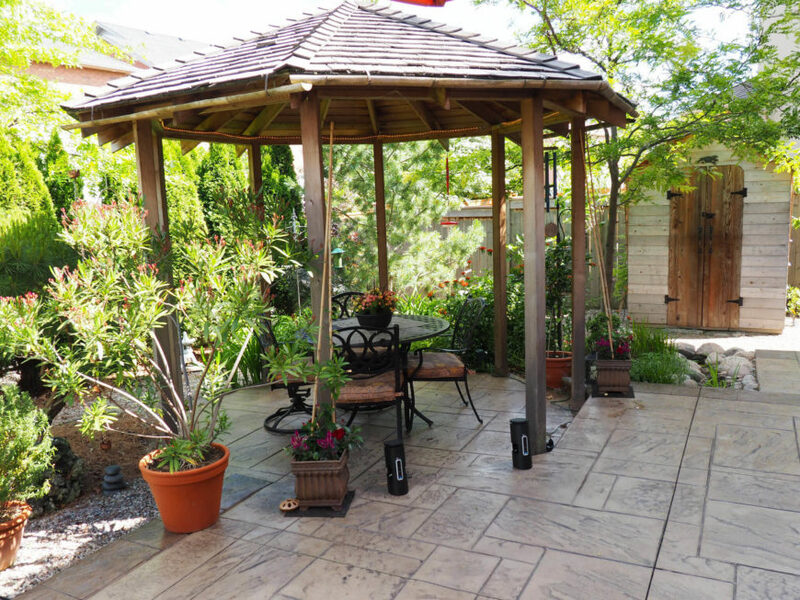 Space – If you have limited space, you may have a hard time fitting a pavilion into your yard. 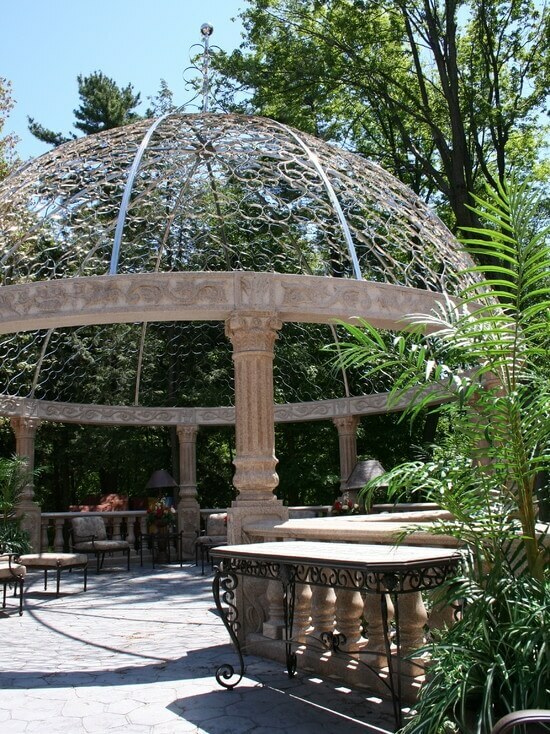 Maintenance – Like any structure, pavilions do require some maintenance. Roof work can be particularly troublesome if you have lots of rain and snow. If your roof begins to leak the pavilion does far less good. While these estimates are far from perfect, they can give you a general idea of what you can expect in cost. 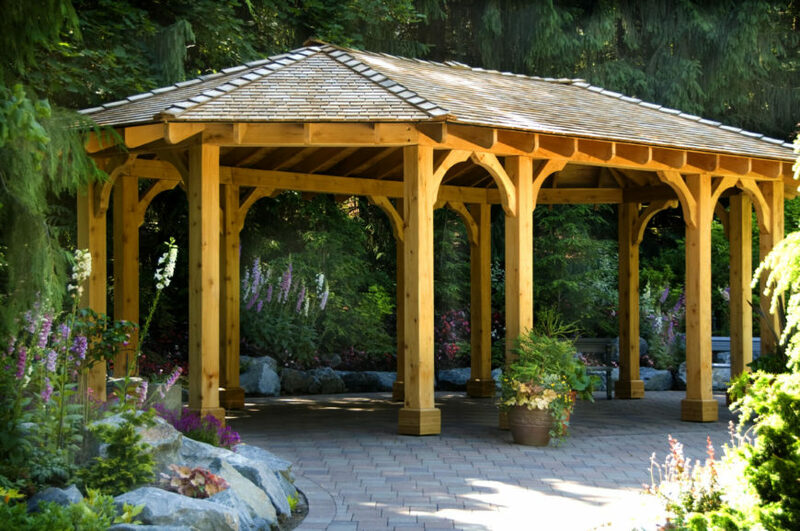 There are a few different types of pavilions that you can build or purchase. Each has their own qualities to consider. 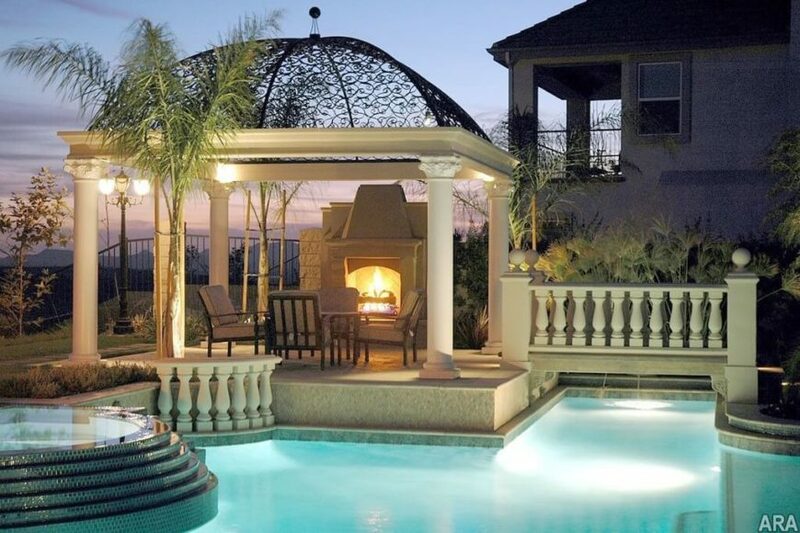 Find more backyard ideas in our definitive guide to backyards! 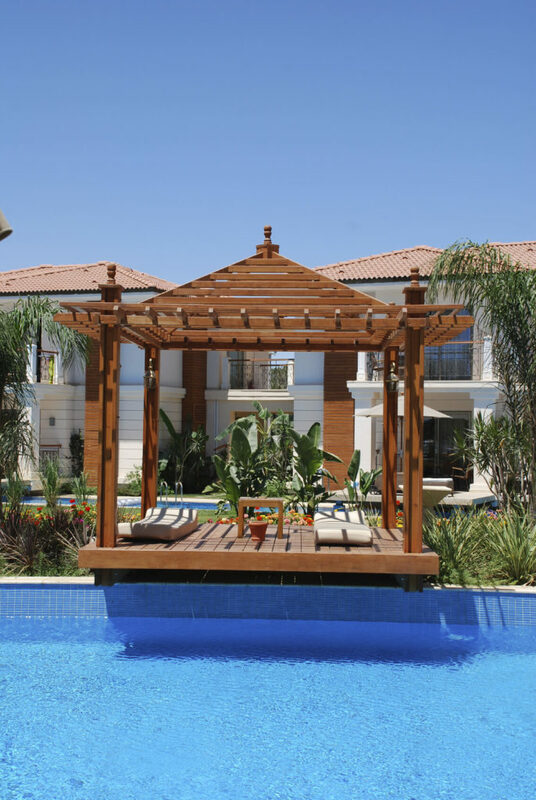 Wooden pavilions have all the advantages of structures made from wood. They have a classic look, and can be stained or painted to fit any style or look you want to achieve. On the other hand, wood exposed to the elements needs care or you risk it rotting, warping, cracking and falling apart. This makes this style of pavilion require maintenance. There is no better place for a bench than under a pavilion. 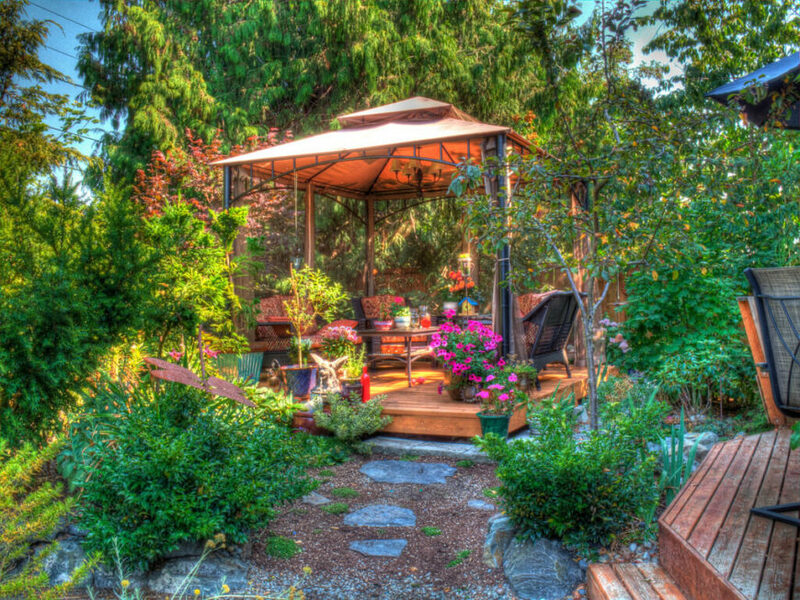 It is a relaxing place to sit back and enjoy the gardens. This pavilion has a slatted roof which provides shade but still lets some sunlight through. 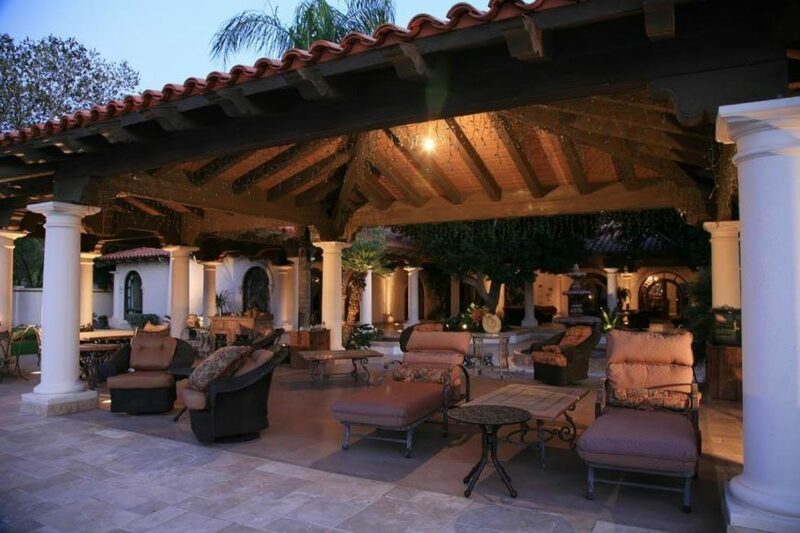 This poolside pavilion is the perfect place to sit back and relax on a sunny summer day. Between laps in the pool you can climb out, relax in the shade, and enjoy the summertime flowers. 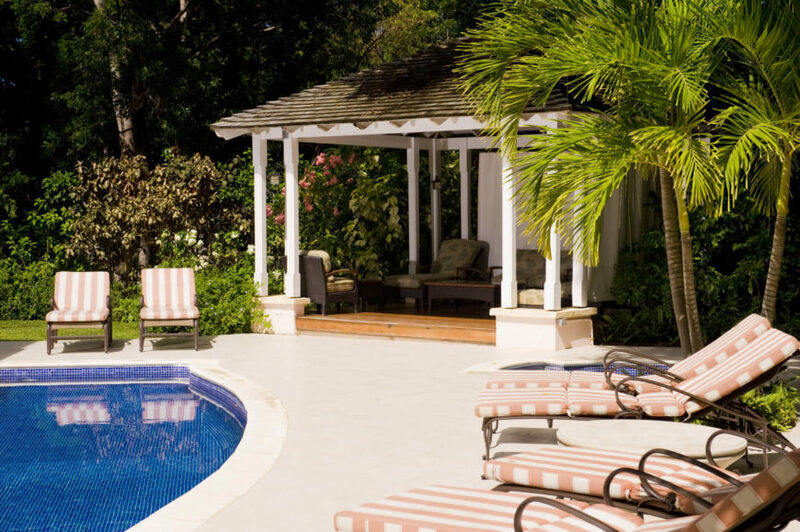 Because the end of the pavilion hangs over the edge of the pool, you can simply slide into the water when you are ready to swim again. 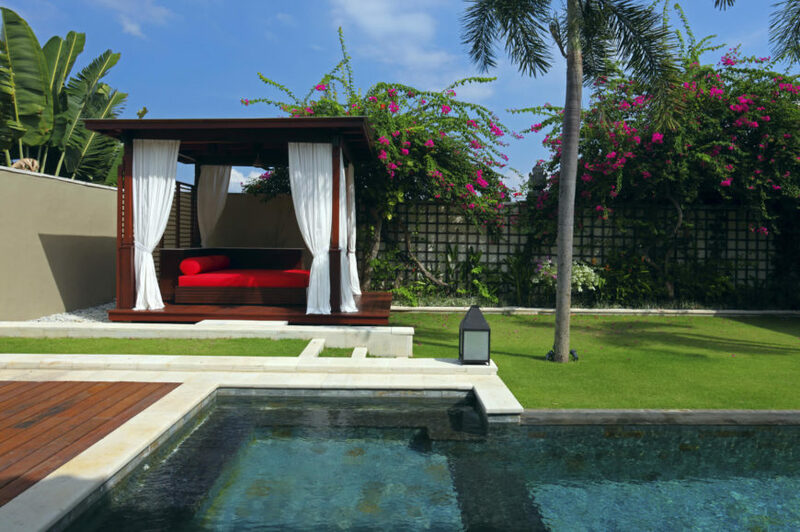 You may place your pavilion in an elevated area so that you have a spot to look over your property. The shady pavilion in this picture sits above a swimming area, where residents can look out over the lake. It’s the perfect place to watch over everything around. This small pavilion casts shade over two outdoor beds. 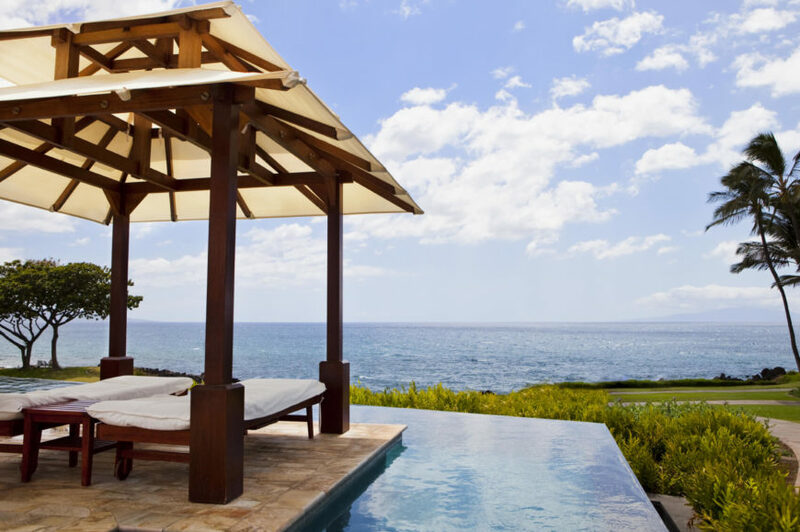 It is true luxury to lay out by your pool, looking over the coast from your shady oasis. What better place for a long outdoor nap? Not all pavilions are gathering places. 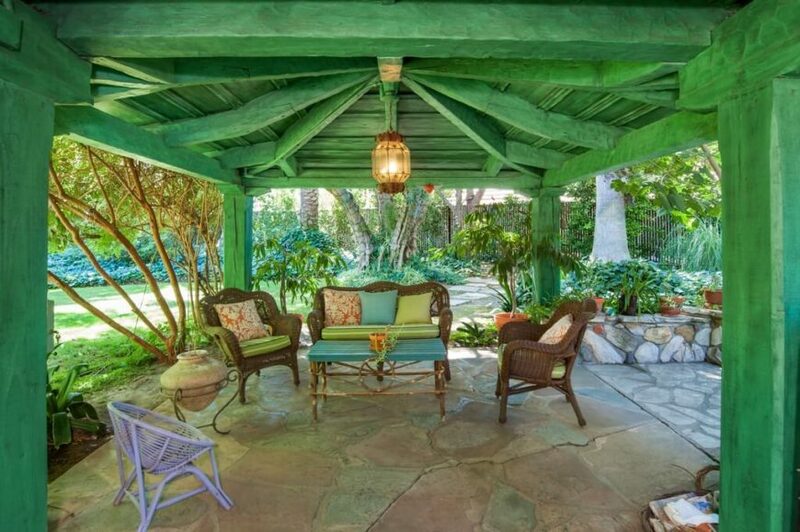 If you have a portion of your walkway that needs a bit of extra shade, a pavilion may be your best bet. It can make walks around the garden more pleasant by not having to be in direct sunlight the entire time. 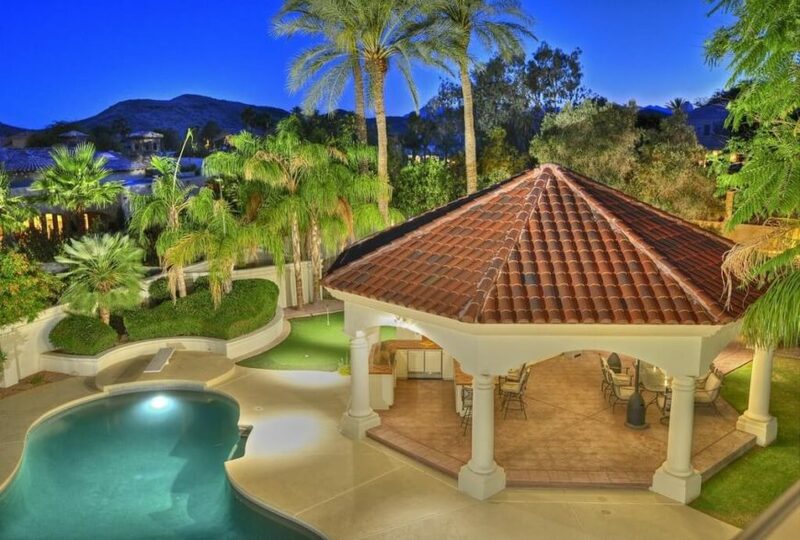 Here is a poolside pavilion that is perfect for a party. Some party goers can splash and play in the water while others kick back in the shade, tell stories, and enjoy the flowers. If you want to add a bit of festive texture to your pavilion, consider a thatched roof. 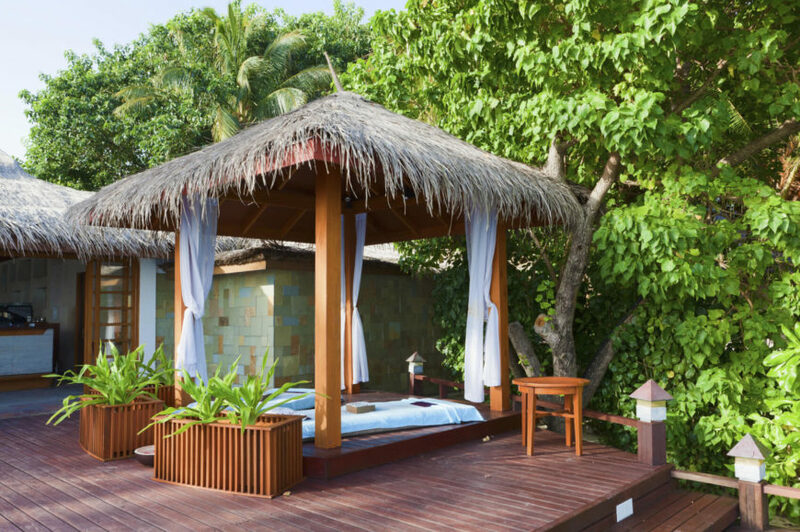 This kind of roof gives your pavilion an island feel. You can easily escape to far off places when the islands are in your own backyard. 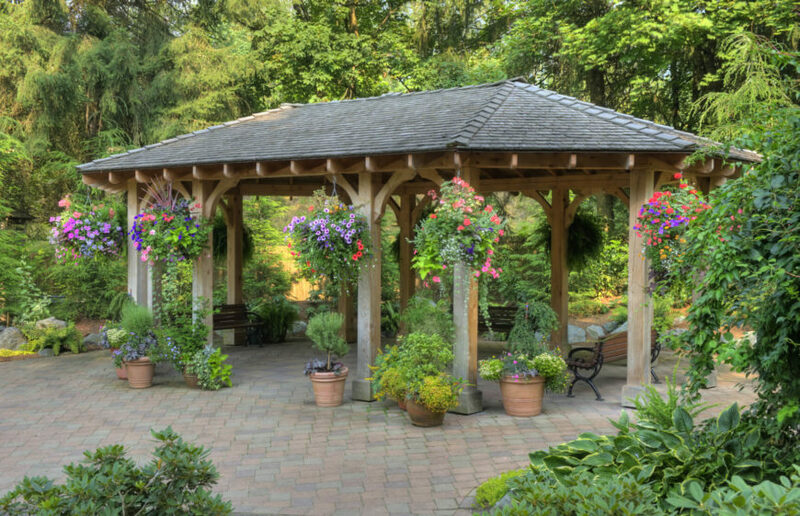 Pavilions are the perfect companion to gardens. Hanging flowers on the outside of a pavilion makes the structure blend into nature. 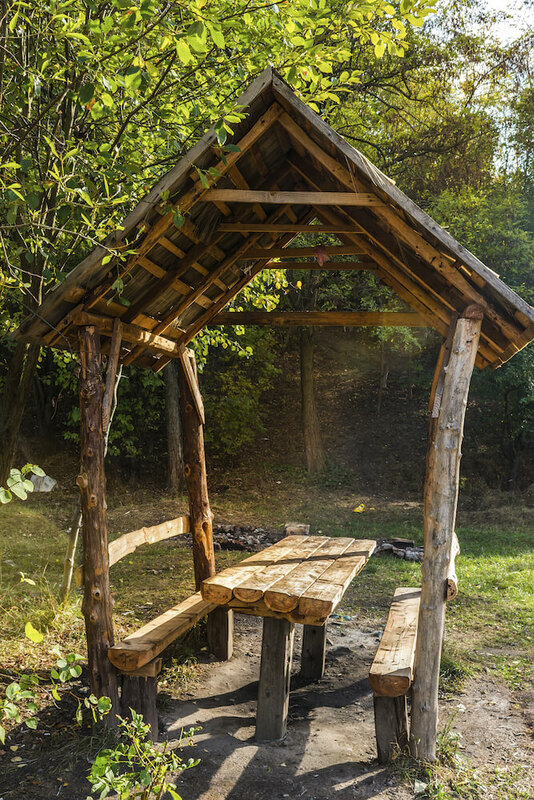 This creates a superb shady place to sit and enjoy the outdoors. Pavilions do not necessarily need to be big. Though it works more as a design feature, this small pavilion provides a small shade respite from the sun. 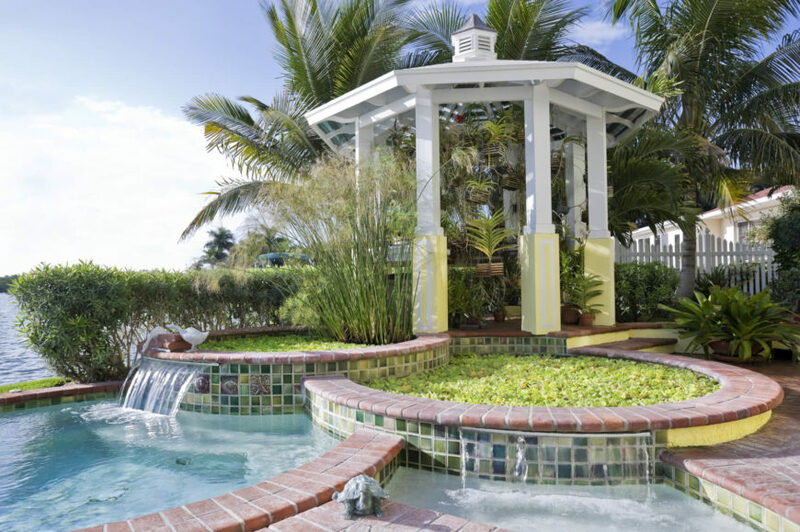 It punctuates the pond with a stunning structure to relax and enjoy the water. Pavilions are not always on land. 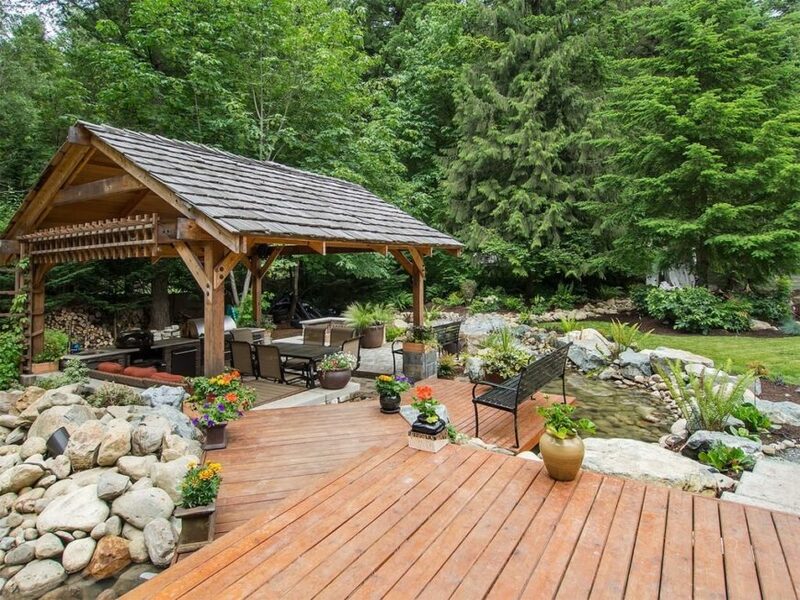 A small pavilion out on a deck is perfect. A few benches under the pavilion provide seating to the area so many people can go out and sit in the middle of the small lake. This small pavilion is built from raw wood and found lumber. The benches are built into the sides of the pavilion with a table in the center. This pavilion is only big enough to cover the few people sitting here, but that is as big as it needs to be. This is a great pavilion table for getting back to nature. This long pavilion has a canvas roof. Canvas is an interesting roofing option. While it is susceptible to damage, it can also be replaced and taken down to be repaired and cleaned. 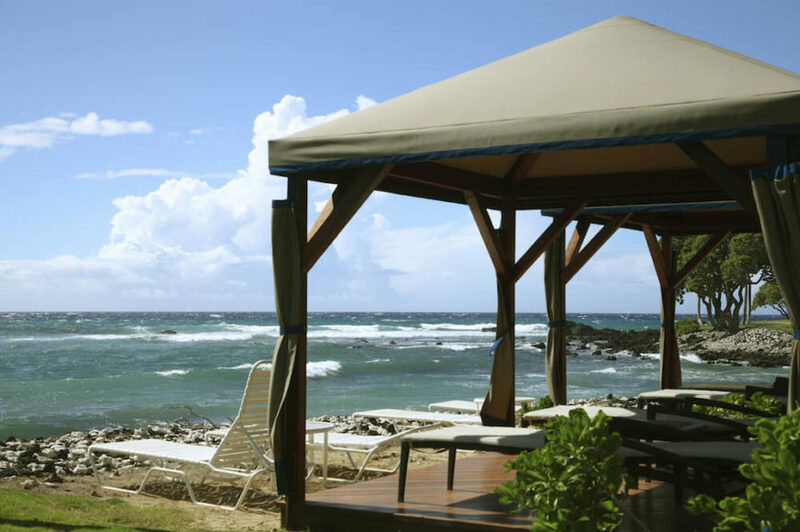 Canvas curtains are also here so that these beach side pavilions can be private in no time. 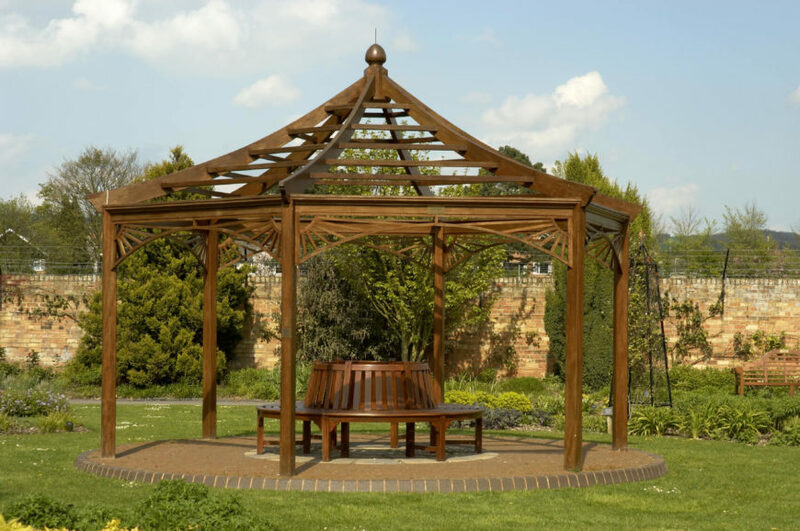 Although a metal pavilion will not have the adaptability or versatility that a wooden pavilion has, metal pavilions can be longer lasting than a wooden structure. 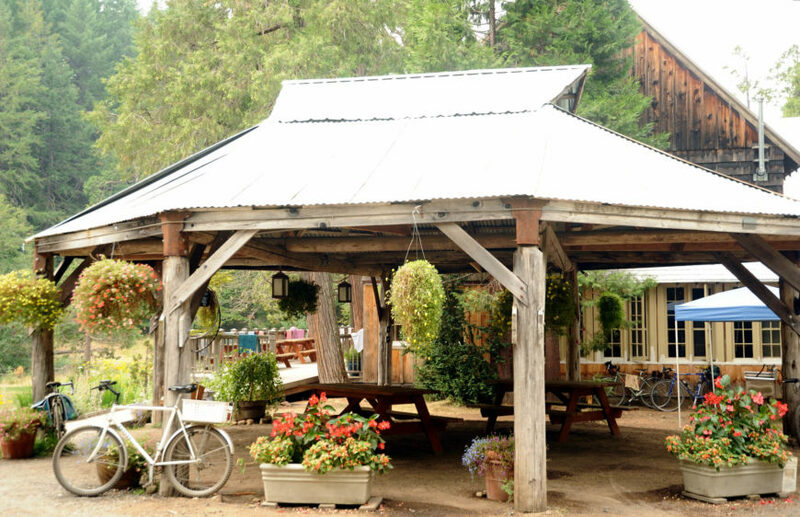 It is difficult to alter the look of a metal structure like you can with one made of wood, but these kinds of pavilions can still be quite stylish. 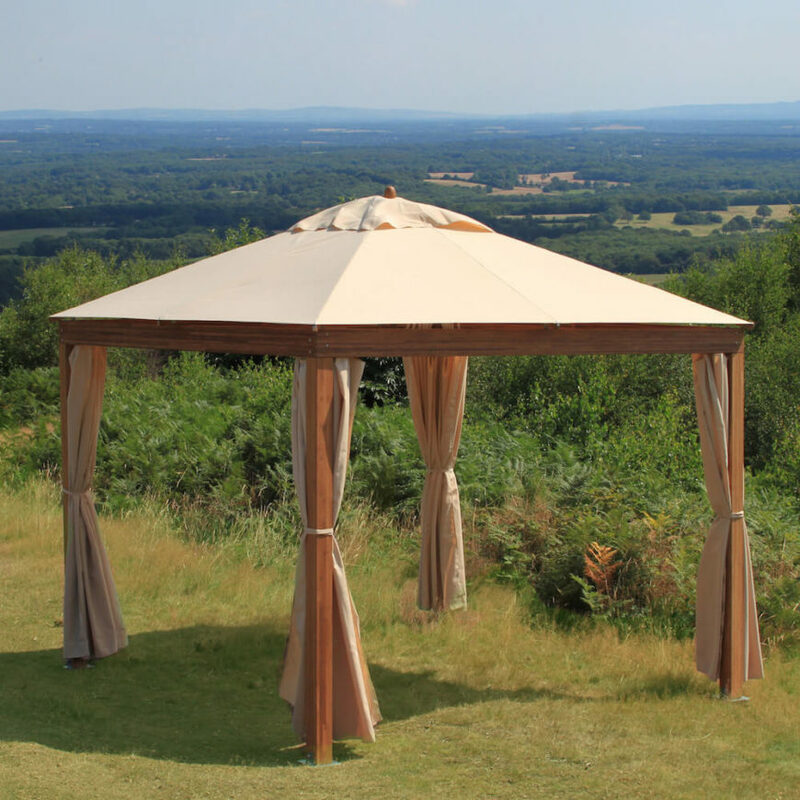 Here is a simple metal pavilion with a cloth top. 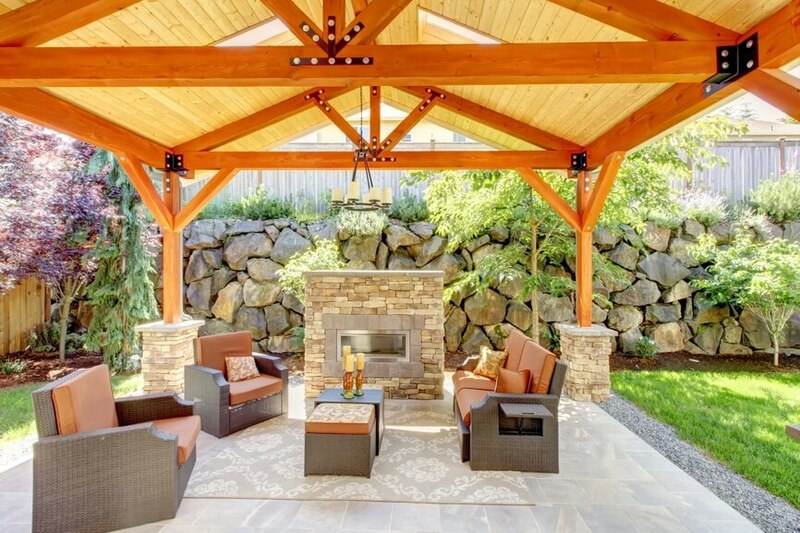 This is a perfect minimal pavilion for a simple yard. It keeps you out of the rain but does not take up a massive amount of yard space. A stone structure has a rustic and natural appeal that is rarely matched. 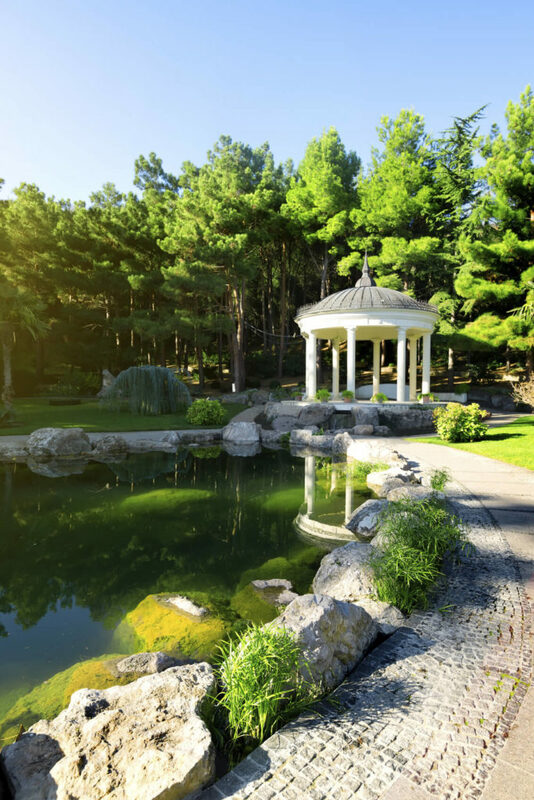 A pavilion with a stone base is strong and sure to last for years. This is the ideal construction if you want a permanent and sturdy structure. Masonry and stone pillars look great and can appear quite elegant. If you want a very professional and finished look you can add a number of features to your pavilion area. This pavilion area has a living room section divided from an eating area. With a setup like this a pavilion can have multiple uses. Not everyone has the space or the money for a permanent pavilion to be constructed. Some people don’t want to commit to such a project either. 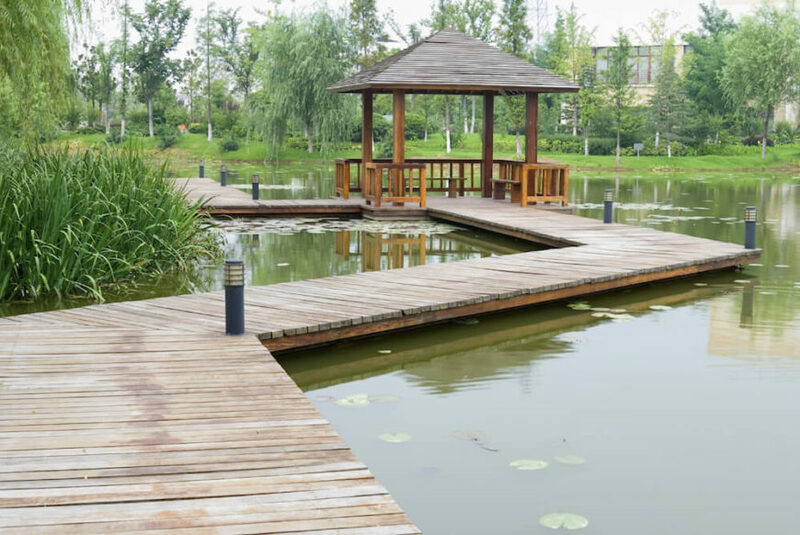 There are pavilions suitable for these instances. You can buy pavilions that are easy to set up and move if need be. These are considerably less expensive and usually easy to set up. Here is a simple wood and canvas portable pavilion. 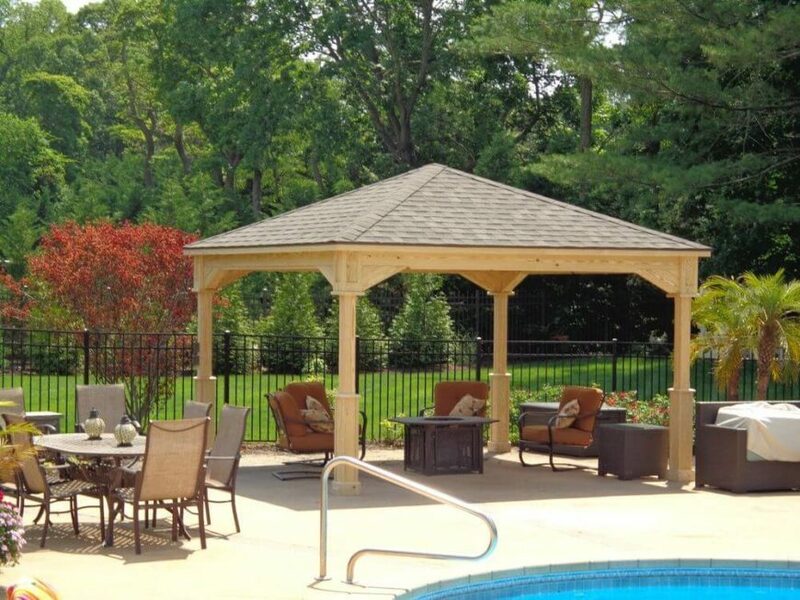 This is a great pavilion for a small gathering or for placing by the pool. 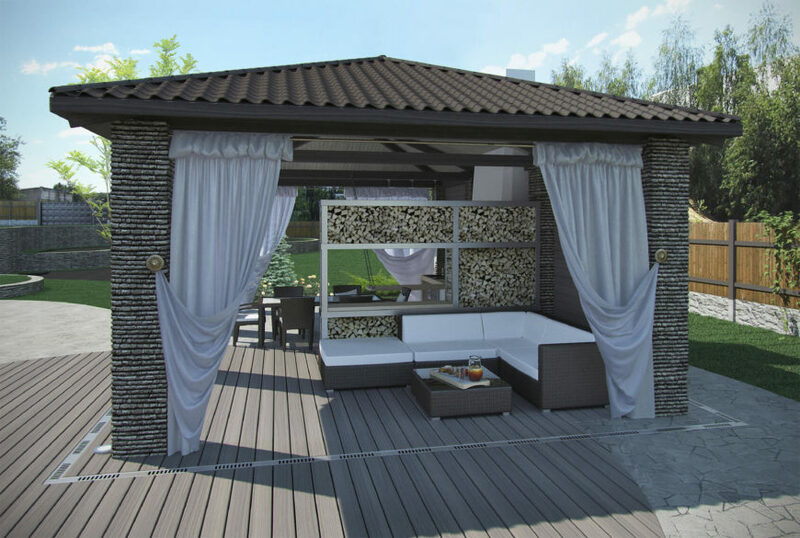 You can place this pavilion almost anywhere and have it be both fashionable and comfortable. Learn more here. This pavilion is a nice prefabricated pavilion that can be set up almost anywhere. It is larger so that you may not want to move it, but it can still be moved if necessary. Learn more here. 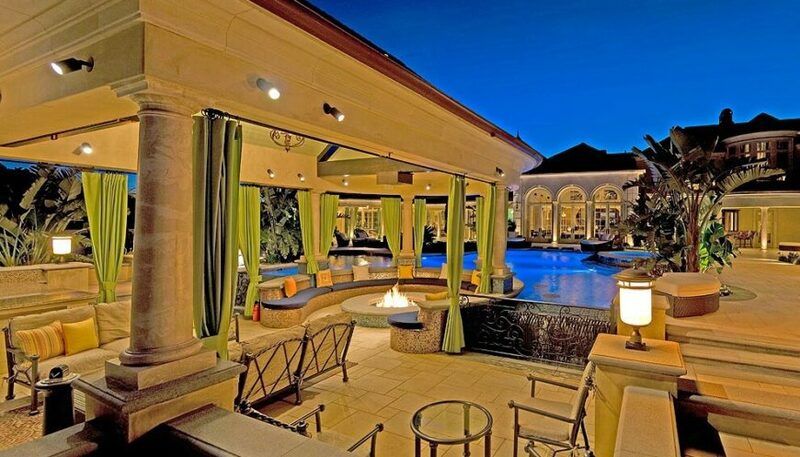 Here is a simple pavilion by a pool. 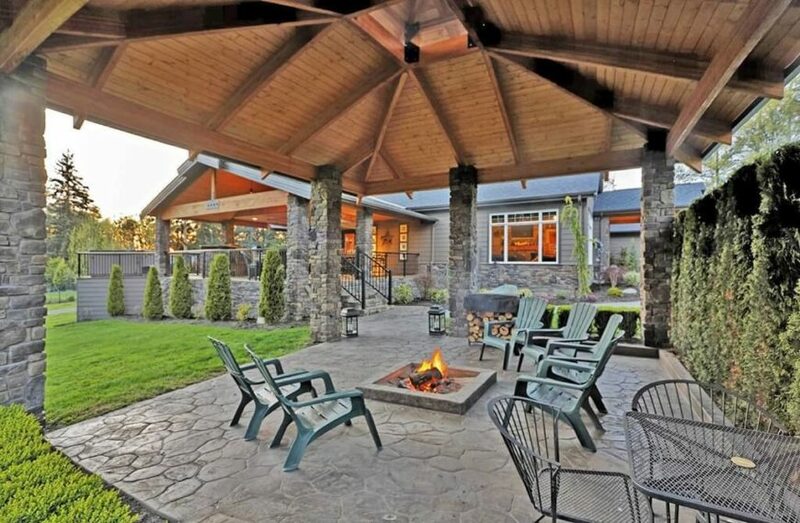 This pavilion is a great pavilion for any yard. 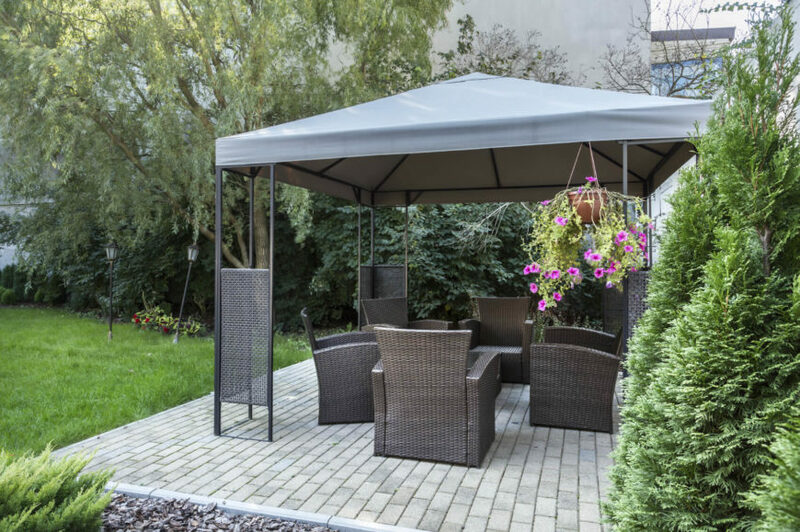 It can be placed in a spot and left there for some time, but can also be moved if your needs change or if you want to rearrange your outdoor design. Learn more here.